These posts originally appeared on the ankur blog in 2013. At the time I‘d recently been on an inspiring writers weekend with Playwrights’ studio,Scotland and was on the lookout for ideas to inspire a new writing project. An email about a competition looking for plays about the environment was the starting point for a play centred on a wetlands project. I didn’t get anywhere in the competition but I had something to work with and over the coming months thought a lot about how to develop the idea further. In the last month I been revisiting my initial ideas and thinking about the main themes. I’ve also been revisiting Saro-Wiwa’s book, finding out more about her father which has lead me to also reading her brother, Ken Wiwa’s book “In the Shadow of a Saint”. His book is about his relationship with his father. Whereas Noo was in her early teens at the time of her father’s death Ken was in his early twenties. His book contain some interesting insights into what kind of man Ken Saro-Wiwa was and what it is like to be the son of a parent who is driven to stand up for the rights of a community regardless or in spite of the cost. At the moment the play isn’t about Ken Saro-Wiwa specifically but I know his story will play a role in shaping the characters I am developing. On a hot summer’s day in July despite engineering works adding an extra hour to my journey I made it to the north shore of the Solway Firth, south east of Dumfries. As part of my research I have visited several nature reserves. From Dumfries train station I made my way south cycling along the River Nith for part of the way to visit Caerlaverock, a national nature reserve. I had been advised that some of the most dramatic scenes occur between September and April when large numbers of Barnacle geese are resident for the winter but there is still plenty to see in the summer. 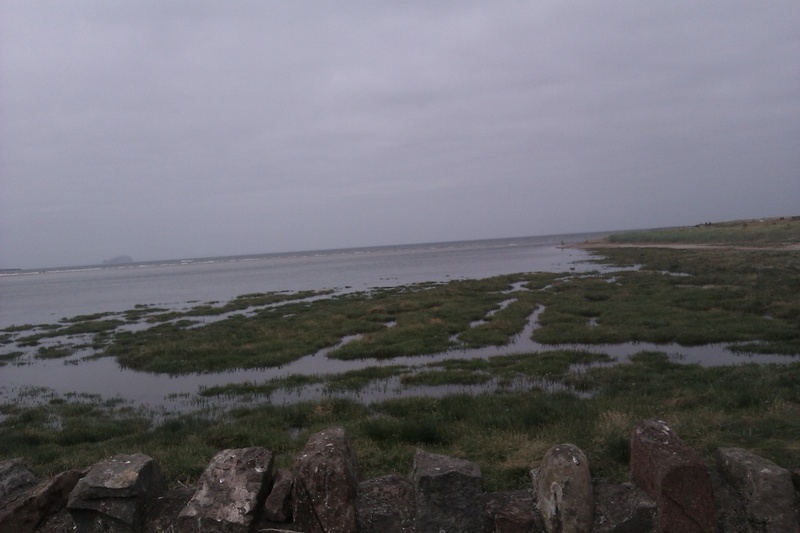 At the Wildfowl and Wetlands Trust centre, I explored the bird watching hides and viewed the large expanse of Merse and mudflats supporting a variety of wildlife. Merse is low level ground by a river or shore the soil is sandy and fertile. Reached by canoe, I spent a night camping on Inchcailloch Island in Loch Lomond national nature reserve. Arriving late afternoon stepping off the Canoe and walking up the stone steps was a magical experience made more so by the carpet of bluebells that covered the Island. In my previous post I discussed how my initial ideas for my project had been inspired by reading Noo Saro-Wiwa’s book. Saro-Wiwa visits a wetland that is under threat from the growing population and their need for more resources. This is a problem echoed around the world, site designations like RAMSAR and National Nature Reserve help to provide a management structure and protection for these areas. As part of my research I came across a cool comic strip about why wetlands are important called Wetlands are not wastelands. I’ve visited Loch Lomond many times in the past but Caerlaverock was new to me, these locations and others including the RSPB Lochwinnoch nature reserve were all inspiring environments in different ways. Inchcailloch was a fun adventure spent with friends; Caerlaverock a solo adventure exploring somewhere new that didn’t disappoint; Lochwinnoch a peaceful sanctuary only 30 minutes by train from Glasgow. I am currently in the process of rewriting my original script based on my research to date it’s been really good to be able to undertake further research, visit nature reserves and participate in the master classes so far with Ben Tagoe and Alan Mckendrick. “I wasn’t used to Nigeria being this unspoilt, beautiful, peaceful, untouched by the relentless land-grabbing of our growing population.”, p167. I started my journey at the edge of the water taking in the view looking to the other side. The Ankur experience has pointed out details I would never have noticed alone, the support and expertise I’ve encountered has been really helpful in developing my skills as a writer. Picture taken in Dunbar, East Lothian along John Muir Way.